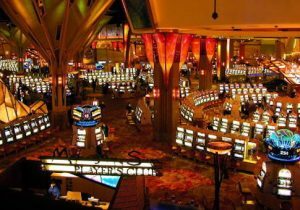 Federal Emergency Management Agency grants meant for disaster relief ended up going to unauthorized casino repairs and a $300,000 "bonus" to a contractor, according to a new audit by the inspector general. The inspector general for the Department of Homeland Security questioned roughly $14 million awarded to the Omaha Tribe of Nebraska and Iowa for flood damage in 2011. The audit, released last week, found "serious and pervasive" mishandling of federal funds by the tribe. "The Omaha Tribe's accounting system and supporting documentation were so unreliable and in such disarray that the only amounts we were able to verify with any degree of confidence were $2.8 million of unneeded funds; $165,000 of unclaimed insurance coverage; and about $74,749 of eligible and supported costs," the inspector general said. "We question the remaining $13.9 million as unsupported." The office of inspector general said it had "little confidence" in any transactions the tribe listed in its accounting system. The Omaha Tribe spent $168,764 in taxpayer funding for "ineligible expenditures to repair its old casino" and awarded $312,282 to itself as a "bonus." FEMA had approved building a new casino, making funds on repairing an old casino ineligible. The Omaha Tribe had money left over on the new casino project and then used it to pay its own contracting company a bonus. "When the Omaha Tribe's wholly owned construction management contractor spent less than the amount FEMA estimated for the new casino, the tribe simply paid $312,282 to the contractor as a ‘bonus' outside the terms of the contract for ‘savings realized,'" the inspector general said. "Of course, a payment to its wholly owned contractor is essentially a payment to itself," the inspector general added. The costs for the new casino were also questioned, as the tribe "could not provide adequate invoices and canceled checks for $5.9 million of the $8.5 million" in construction costs. The Omaha Tribe also made a $210,000 payment to its own construction management contractor. The inspector general blamed the misuse of funds on the Omaha Tribe using tribal law, rather than adhering to federal regulations. "These problems occurred for many reasons; however, the Tribal Emergency Management Director said that the principle of tribal sovereignty overrides Federal regulation and allowed the tribe to manage its grant through tribal law," the inspector general said. "Tribal sovereignty is the inherent authority of indigenous tribes to govern themselves," the inspector general continued. "However, the principle of tribal sovereignty does not allow Native American tribes to poorly manage their finances, profit from Federal grants, pay themselves bonuses, or disregard Federal regulations." The inspector general recommended FEMA designate the tribe as a "high-risk grantee" and disallow any funds that went to unauthorized work.